UPDATED Feb. 5, 2019. Liberty Medicare is a full service, licensed independent insurance agency specializing in various Medicare plans for people above age 65 or on disability, and Individual Health Insurance plans for people under the age of 65. Our services are offered within the following eight states: Delaware, Illinois, Maryland, New Jersey, New York, Ohio, Pennsylvania, and Virginia. Liberty Medicare is here to help you in selecting and enrolling in the best and most suitable MEDICARE PLANS, including Medicare Supplement Plans (Medigap Plans), Medicare Advantage Plans, and Medicare Part D Plans (Medicare Prescription Drug Plans). When was Liberty Medicare opened? Liberty Medicare was opened in June 2010. 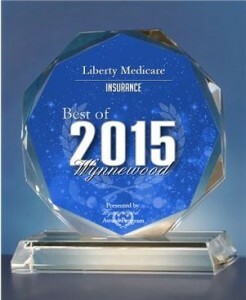 It is located in Wynnewood, PA – in the suburbs of Philadelphia, PA.
Liberty Medicare has been selected for 2015 Best of Wynnewood Award in the Insurance category by the Wynnewood Award Program. Mr. Gregory Lazarev is the President of Liberty Medicare. Before starting Liberty Medicare, he was a scientist in the field of Solid State Physics and later worked as a Computer Science Consultant. His consulting assignments included projects for such clients as IBM, DuPont, Chase Manhattan Bank, SmithKline Beecham, and many others. He is the author of the book Why Prolog? Justifying Logic Programming for Practical Applications (Prentice Hall, 1989), and of many publications in physics and computer science. Working with an independent insurance agency like ours gives you the benefits of objectivity. We are NOT employed by any specific insurance company, but instead, represent a wide variety of carriers. It allows us to work honestly for our clients by comparing numerous plans and selecting the one that is BEST for YOU. We only represent well-established and nationally known providers doing business within the eight states we serve. There is NO CHARGE to you for our service. We provide a Lifetime Commitment as long as you have a policy with us. We’ll let you know about any price or benefit changes to your policy. At renewal time, we will compare the price and benefit terms offered by your current policy with those terms provided by other insurance companies.